The story of Count Basie is very much the story of the great jazz band that he led for close to 50 years (1935-1984), an orchestra with a distinctive sound, anchored by a subtle but propulsive beat, buoyed by crisp ensemble work, and graced with superb soloists (indeed, a catalogue of featured players would read like a Who's Who of Jazz). But perhaps the most startling aspect of the band's achievement was its 50-year survival in a culture that has experienced so many changes in musical fashion and, especially, its survival after the mid-1960s when jazz lost much of its audience to rock music and disco. Moten's death in 1935 altered Basie's career dramatically. He took over the remnants of the band (they called themselves The Barons of Rhythm) and, with some financial and promotional support from impresario John Hammond, expanded the personnel and formed the first Count Basie Orchestra. Within a year or so the band had developed its own variation of the basic Kansas City swing style -- a solidly pulsating rhythm underpinning the horn soloists, who were additionally supported by sectional riffing (i.e., the repetition of a musical figure by the non-soloing brass and reeds). This familiar pattern is evident in the band's theme song, "One O'Clock Jump, " written by Basie himself in 1937, which has a subdued, expectant introduction by the rhythm section (piano, guitar, bass, and drums), then bursts into full orchestral support for a succession of stirring solos, and concludes with a full ensemble riffing out-chorus. Like any great swing band, Basie's was exciting in any tempo, and in fact one of the glories of his early period was a lugubrious, down-tempo blues called "Blue and Sentimental, " which featured two magnificent solos (one by Herschel Evans on tenor saxophone and the other by Lester Young on clarinet) with full ensemble backing. By 1937, Basie's band was, with the possible exception of Duke Ellington's, the most highly acclaimed African American band in America. In the racially segregated context of the pre-World War II music business, African American bands never achieved the notoriety nor made the money that the famous white bands did. But some (Ellington's, Earl Hines's, Jimmy Lunceford's, Erskine Hawkins's, Chick Webb's, and Basie's, among them) did achieve a solid commercial success. Basie's band regularly worked some of the better big city hotel ballrooms and shared with many of the other 1,400 big bands of the Swing Era the less appetizing one-nighters (a series of single night engagements in a variety of small cities and towns that were toured by bus). Some of the band's arrangements were written by trombonist Eddie Durham, but many were "heads" -- arrangements spontaneously worked out in rehearsal and then transcribed. The band's "book" (repertory) was tailored not only to a distinctive orchestral style but also to showcase the band's brilliant soloists. Sometimes the arrangement was the reworking of a standard tune -- "I Got Rhythm, " "Dinah, " or "Lady, Be Good" -- but more often a bandsman would come up with an original written expressly for the band and with a particular soloist or two in mind: two of Basie's earliest evergreens, "Jumpin' at the Woodside" and "Lester Leaps In" were conceived primarily as features for the remarkable tenor saxophonist Lester Young (nicknamed "Pres, " short for "President") and were referred to as "flag wavers," up-tempo tunes designed to excite the audience. Unquestionably, the Swing Era band (1935-1945) was Basie's greatest: the superior arrangements (reflecting Basie's good taste) and the sterling performers (reflecting Basie's management astuteness) gave the band a permanent place in jazz history that even severe personnel setbacks couldn't diminish. Herschel Evans' death in 1939 was a blow, but he was replaced by another fine tenorist, Buddy Tate; a major defection was that of the nonpareil Lester Young ("Count, four weeks from tonight I will have been gone exactly fourteen days. "), but his replacement was the superb Don Byas; the trumpet section had three giants -- Buck Clayton, Harry "Sweets" Edison, and Bill Coleman -- but only Edison survived the era as a Basie-ite. Perhaps the band's resilience in the face of potentially damaging change can be explained by its model big band rhythm section, one that jelled to perfection - the spare, witty piano of Basie; the wonderful rhythm guitar of Freddie Green (who was with the band from 1937 to 1984); the rock-solid bass of Walter Page (Basie's former employer); and the exemplary drumming of Jo Jones. Nor was the band's excellence hurt by the presence of its two great blues and ballads singers, Jimmy Rushing and Helen Humes. The loss of key personnel (some to the military service), the wartime ban on recordings, the 1943 musicians' strike, the economic infeasibility of one-nighters, and the bebop revolution of the mid-1940s all played a role in the death of the big band era. The number of 12 to 15 piece bands diminished drastically, and Basie was driven to some soul-searching: despite his international reputation and the band's still first-rate personnel, Basie decided in 1950 to disband and to form a medium-sized band (first an octet and later a septet), juggling combinations of all-star musicians, among them tenorists Georgie Auld, Gene Ammons, and Wardell Gray; trumpeters Harry Edison and Clark Terry; and clarinetist Buddy DeFranco. The groups' recordings (Jam Sessions #2 & #3) are, predictably, of the highest quality, but in 1951 Basie reverted to his first love - the big band - and it thrived, thanks largely to the enlistment of two Basie-oriented composer-arrangers, Neil Hefti and Ernie Wilkins; to the solo work of tenorists Frank Wess and Frank Foster and trumpeters Joe Newman and Thad Jones; and to the singing of Joe Williams. Another boost was provided in the late 1950s by jazz organist Wild Bill Davis's arrangement of "April in Paris" which, with its series of "one more time" false endings, came to be a trademark of the band for the next quarter of a century. 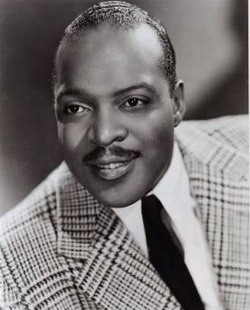 Basie appeared in musical films during World War II, most notably the 1943 review Stage Door Canteen. Following the end of the war in 1945, the big-band sound began to decline in popularity. The Count Basie Orchestra, which was plagued by financial problems and poor management, broke up for a time. In the interim, Basie formed an eight-member band that included Clark Terry, Wardell Gray on tenor, and Buddy DeFranco on clarinet. However, in 1952, he resurrected the Count Basie Orchestra. With the addition of singer Joe Williams, the band enjoyed success with records like "Every Day (I Have the Blues)" and "April in Paris." The band embarked on a tour of European cities, and performed before enthusiastic crowds. In 1957, the Count Basie Orchestra became the first African American band to play the Waldorf-Astoria in New York City. During the 1950s, Basie's band remained remarkably steady in its line-up, and he was a well-liked, modest man despite his regal nickname. "Bill Basie's keyboard style is one of the happiest and most readily identifiable sounds in jazz," wrote Nat Shapiro in 1957 in The Jazz Makers. "To the casual listener, it is no more than a formless and spontaneous series of interjections, commas, hyphens, underlines, quotation marks and interrogation and exclamation points." The orchestra had a standing gig at Birdland in New York, and "there was no better place to hear Basie in peak form, surrounded by his most loyal fans," wrote Dan Morgenstern in Rolling Stone. "Sometimes the band swung so hard that he would lift his hands from the keyboard and just sit there, beaming--the image of a man delighted with his work, which, simply put, was to make people feel good." A stocky, handsome, mustachioed man with heavy-lidded eyes and a sly, infectious smile, Basie in his later years took to wearing a yachting cap both off and on the bandstand. His sobriquet, "Count," was a 1935 promotional gimmick, paralleling "Duke" (Ellington) and "Earl" (Hines's actual first name). He was a shrewd judge of talent and character and, ever the realist, was extremely forbearing in dealing with the behavioral caprices of his musicians. His realistic vision extended as readily to himself: a rhythm-centered pianist, he had the ability to pick out apt chord combinations with which to punctuate and underscore the solos of horn players, but he knew his limitations and therefore gave himself less solo space than other, less gifted, leaders permitted themselves. He was, however, probably better than he thought; on a mid-1970s outing on which he was co-featured with tenor saxophone giant Zoot Sims he acquitted himself nobly. Among Basie's many recordings perhaps, the most essential are The Best of Basie; The Greatest: Count Basie Plays … Joe Williams Sings Standards; and Joe Williams/Count Basie: Memories Ad-Lib. There are also excellent pairings of Basie and Ellington, with Frank Sinatra, with Tony Bennett, with Ella Fitzgerald, with Sarah Vaughan, and with Oscar Peterson. In addition to his musical career, Basie owned a bar on 132nd Street in Harlem. For 25 years, he and his wife Catherine lived in the Queens neighborhood of St. Albans with their five children. Eventually, the Basie family moved to Long Island. Basie performed regularly during the 1960s. He also recorded albums and toured with singers such as Ella Fitzgerald and Frank Sinatra. The Count Basie Orchestra played at the 1961 inaugural ball for President John F. Kennedy, and made frequent television appearances during the decade. In 1965 Basie signed with Reprise, Frank Sinatra's label, and began adapting pop tunes to the big-band sound, which was a great commercial success. During the 1970s, Basie signed with Pablo Records and recorded many big-band standards. However, he also began to experience various health problems. In 1976, Basie was forced to retire for a time after suffering a heart attack. He returned to the recording studio in 1979 and released On the Road and Afrique, an avant-garde jazz album. Basie was later diagnosed with pancreatic cancer and soon lost the ability to walk on his own. In 1976, Basie suffered a heart attack, but returned to the bandstand half a year later. During his last years he had difficulty walking and so rode out on stage in a motorized wheelchair, his playing now largely reduced to his longtime musical signature, the three soft notes that punctuated his compositional endings. His home for many years was in Freeport, in the Bahamas. Count Basie died of cancer at Doctors' Hospital in Hollywood, Florida, on April 26, 1984. His wife, Catherine, had died in 1983; they had one daughter. The band survived Basie's death, with ex-Basie-ite trumpeter, Thad Jones, directing until his death in 1986. Click here to return to the Let My People Swing! main page.